I don't take lists for granted. When I reflect on some of the major successes I've enjoyed in genealogy over the past 15 years, it is clear that they have been due largely to the invaluable help I received from the early genealogy forums and user groups (once sponsored by AOL, CompuServe, Prodigy, etc.) and from Listservs. Very best example: My father's family lost contact with some cousins in Belarus after my paternal grandmother, Anna, died in 1976. 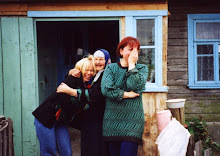 In 1998, a young woman named Ilona (either from the Belarus Discussion list connected to A Belarus Miscellany online, or from the soc.culture.belarus group, I can't recall; all our correspondence was via AOL) found those cousins for me within five months. I e-mailed her JPGs of some photos dating back to the 1950s-60s. She e-mailed them to her father, who was a physician in Radun, Belarus. He showed them to everyone he came in contact with. Within a couple weeks, someone recognized my cousin Maria from a 1965 photo. Ilona's father drove to Maria's village to meet her and relate this story. He e-mailed Ilona Maria's address; Ilona e-mailed it to me. When I traveled to Belarus in 2001, I finally met Maria and her family. Extraordinary! Could I have done this on my own? Maybe ... but it seems unlikely. Just recently, a member of one of my favorite lists e-mailed me some JPGs of church records that had caught his eye while he was doing his own family research. He thought they might interest me, since they involved two Prokopowicz families from our mutual ancestral area. Among them was the 1845 baptismal record of my maternal great-grandfather, Kazimierz Prokopowicz! How many years had I been looking for that? Oh, only about 15. I simply hadn't hit on the correct year in my search. Kazimierz had been my missing link. Seeing his father's name on the baptismal record allowed me to take that family line back three more generations. In between Ilona in 1998 and Marek in 2010, dozens of fellow list members have helped me in more ways than I can detail here. They have been from all over North America, Europe, and Australia. We have communicated in English, Polish, and Russian (just a few feeble attempts on my part). They have explained and translated arcane 18th-19th-century Polish and Russian terminology, offered insight into history and culture, and shared PDFs of documents and URLs of Web sites. Always generously, always graciously. Honestly, I have always tried to be equally helpful on my lists, whenever I've felt I had something worthwhile to offer. Good karma is a two-way street. Every one of those Listservs has been worthwhile. I subscribe to them in digest form. This means that for each Listserv, I receive only one e-mail a day, and it contains all the messages posted in the past 24 hours or so. Each day, a dozen or so lists appear in my inbox, and I read them with my morning coffee. Some I skim and delete quickly, some I spend considerable time with, depending on the topics. Below are my four favorite Listservs. I have not identified any members by name, simply in respect for their privacy, as much as I'd like to give shout-outs to some of the most knowledgeable and helpful. The founders and moderators, whether named here or not, are all my heroes for providing such wonderful forums for thousands of family researchers. And among the thousands of list members, I'm happy to have made some genuinely great friends. If I could give a giant gold star, or some impressive trophy, or better yet, a great big hug, to my all-time favorite Listserv, it would be to LidaRoots. The icons and flags on the home page for this Yahoo! group represent the ethnic and religious diversity that make this area of western Belarus so culturally rich. Unlike lists geared to specific narrow groups (my own PolishMass among them), LidaRoots opens its heart and mind to everyone with ancestry in this area or an interest in its history. This list has garnered more than a thousand members since it was founded by Stefan Wisniowski in 2001. I can't improve upon the compelling description on its home page: "The 'Kresy-Siberia Group' brings into contact people from countries around the world with a special interest in the fate of over one million Polish citizens of various faiths and ethnicities (Polish, Ukrainian, Belorussian, Catholic, Orthodox, Jewish, etc.) arrested or deported from eastern Poland (Kresy) to special labour camps in Siberia, Kazakhstan and Soviet Asia. The circumstances of their odyssey and the tragic history of the Polish citizens under Soviet occupation during WW2 was hushed up by the Allies during the war to protect the reputation of the Soviet Union, an important ally fighting the Nazis. "Sixty years later the survivors have aged and many have died. With this list we hope to bring together surviving deportees and their descendants to remember, learn, discover and spread the word of their ordeal to the world and to future generations." This list has helped me to understand the experiences of my family in Poland's eastern borderlands, the kresy, during and after World War II. And it has helped me to find detailed information about some of them and their own odysseys. I receive much more than I can possibly give here, and I am grateful beyond measure. Founded in 1999 and sponsored by the Lithuanian Global Genealogical Society, this list has 2,277 members. Like LidaRoots and Kresy-Siberia, this is a dynamic, helpful group of people with some highly skilled members here and abroad. It has taught me much about the Lithuanian aspect of the Polish-Lithuanian Commonwealth and all its geographic and political morphing over the centuries. As I trace my paternal roots increasingly northward from Belarus into Lithuania, I expect my interest here to grow even stronger. More than 2,200 members have joined this group since it was created in 2005. I think that speaks to the ever-increasing interest in DNA research for genealogy. The list is sponsored by the International Society of Genetic Genealogy (ISOGG). The moderators are extremely knowledgeable and unceasingly helpful to people like me, who are, frankly, just trying to understand the results of the DNA tests we order to complement our paper-trail genealogical research. I am not a sciencey person. My high school Algebra II teacher, Sister Mary Celine, made me promise not to major in math in college. No matter how many books I read or workshops I attend, very, very little of all those strings of numbers and ACGT letters on the test results mean anything to me. I am a DNA newbie. I am lucky someone started this list. Thank you so much for mentioning DNA-NEWBIE! I just received some DNA results from a cousin who, by a quirk of genetics, has the same mitochondrial DNA as me. He and I are trying to use the information to trace the progress of lipedema, a hereditary disorder shared by several women in my family including me. You rock! -- Pat Washburn, who worked with you long ago in a newsroom far away. Pat, thank you! This DNA research is so fascinating. Did you do your tests through 23andMe? They seem to be really active in genetic issues. I think it's really cool that you and your cousin are exploring this together. That is awesome! I really appreciate that you have taken the time to put all your information in a blog form. This gives me a really great starting point in collecting all of my relatives lost documents. I'm struggling with finding out who my grandparents were, since my father never talked of them and now is deceased. I've discovered several important documents to start with. One simple one was the 1930s Census with my grandparents names. Stanley Prokopowicz was listed as their neighbor in Dorchester. Would this be a relative of yours? Thank you! I appreciate your feedback, and I'm happy my blog is helpful to you. If you have even a few documents, you are on your way to learning a lot about your family. I kind of think the less you know at the outset, the more exciting each new discovery is. And about Stanley Prokopowicz—small world! I have no idea whether my grandfather Julian had contact with him in their early years in the U.S., but I've been collecting documents about Stanley (I collect Prokopowiczes!). His World War I draft registration lists his birthplace as Poleckiszki, which is the village Julian's family lived in since the 1700s. So they must have been cousins. Thanks for mentioning him! It is a small world. My grandfather lived a 6 Bellflower, and they lived a 4 Bellflower. I'm sure my aunt would remember the name. She married my uncle and lived on Bellflower for quite a while. My grandfather came to the US through via the White Star Line out of Liverpool. Can you direct me to the right places to find out how he got from Poland to Hamburg, and from Hamburg to Liverpool? Wow, the Bellflower connection is amazing. I am very curious about Stanley P.; now I'm motivated to request his naturalization papers. I'd love to see a photo of him. To get a general idea of how he got from Poland to Liverpool, you might read my September 4, 2009 post, "Ports of Departure: Hamburg, Liverpool, Libau." To find specific info on his journey to Liverpool, you can search two different websites, which I think use more or less the same database. On Ancestry.com, it's "UK Incoming Passenger Lists, 1878-1960." On Find My Past (http://www.findmypast.co.uk/migration.jsp), it's "Passenger Lists Leaving UK 1890-1960." Don't be surprised if his name is spelled slightly differently than on the passenger list for his arrival in the U.S. Good luck with the search! Oops! I have to retract the suggestion for Ancestry. I just read the description, and their UK database is for "ships arriving in the United Kingdom from foreign ports outside of Europe and the Mediterranean." Find My Past has the passenger lists for departures from ports like Liverpool. On the manifest, the last two columns on the right report the person's arrival in the UK by port (e.g., Libau to Hull) and steamship line, which would have been a small "feeder" line. Camille, search for your grandfather on this site. The search is free. E-mail me privately if you find him and need the image. I'll ask my Aunt if she remembers any of the Prokopowiczs. She attended Our Lady of Czestochowa for many years. She has an incredible memory. She is Italian, and married my dads brother (who passed away in the 80s), yet she remembers so much about how the Polish side of the family is connected. Thank you for the suggestions. I would look through those links. Thank you for your post. I just saw this through Geneabloggers. I've been trying to reconnnect with family members back in Ireland. Perhaps some of these sites might be very helpful with that.